The growing population of the New Republic of Venice needs new, or at least revitalised, institutions to cope with the influx of recently arrived energetic and predominantly youthful inhabitants. Venetians, new and established, look to the ancient Scuole: both the Scuole Piccole – a form of trade guild and the Scuole Grandi – charitable foundations with strong artistic pretensions. Both of these organisations combined roles in the social life of the city with its less tangible, perhaps even, spiritual life. In both cases, but especially with the Scuole Grandi, these aspects were manifested in bold architectural forms following clear urban and internal forms and typologies. We have invented a scenario which is not fanciful, which is rooted in clear and present political realities and which considers the architectural implications of those realities. In the same sense your buildings will also not be fanciful; instead we encourage sophisticated material, formal and theoretical responses to place, history and community. We disagree with Jonathan Glancey, Venice is not a dead, museum city – it is alive and kicking. 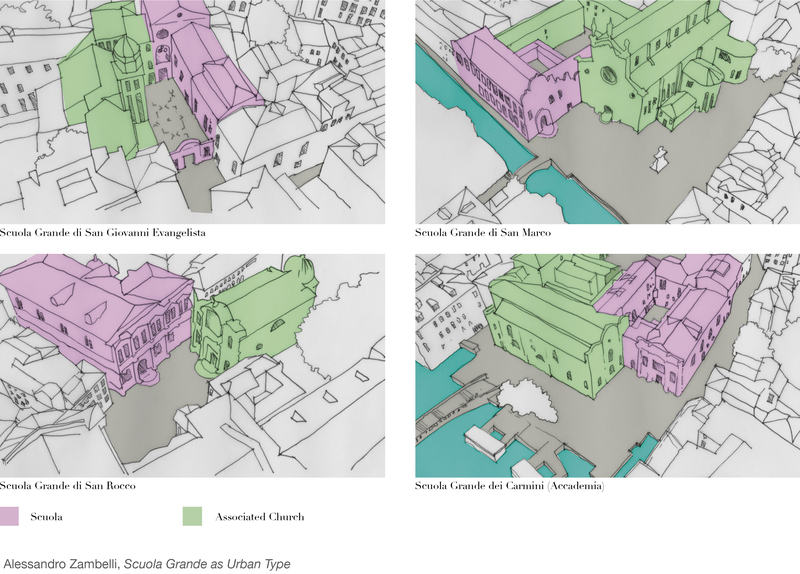 The image at the top is my quick analysis of Scuola ‘type’ at an urban scale, but the Scuole also follow an internal pattern closely tied to their programme. Fig.1 shows three of them.